Cargo trading between planet based trade cities is the main and best way to obtain credits and XP. There are a few things that are needed to trade cargo between planets and a few that are highly recommended. Credits- to purchase crates, 500-1000c should get you started. A starship- with some ammount of sticky pistons to place crates onto. A space suit- to survive in space and the harsh conditions of some planets. Power armor- with corresponding modules. (Enviromental module and rocket boots are especially useful). Hyperdrive- even more useful paired with a navigation computer. Shields and Ship weaponry- to help fend of any pirates. Blasters- for protection from mobs and pirates. To start trading you first need to find a trade city to buy crates from. Their names all begin with the planet name and end in "-ost". The above example is the outpost from Quod Canis, hence the name "Quodcanost". 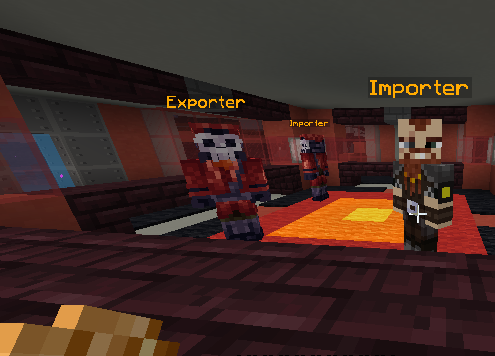 Once you have arrived and either landed or docked, locate the Importer and Exporter Npcs. They are easy to locate and have a variety of skins. Right click on the Exporter Npc to get a cargo crate mission. You will see a GUI simlar to the one below. Hovering your cursor over each crate will bring up lots more info to consider. Destination - Outpost name and planet to deliver to. Total Crates - Ammount of crates to be purchased and thus placed in your ship. Cost - Total cost to buy all the crates. Route Value - The Higher the value the more xp given and higher potential profit. Max is 2.0. Days until expiry - How many days given to comlete mission. Once you have found the right mission left click to accept. The crates will be given and any not able to fit into the inventory will be dropped on the ground. 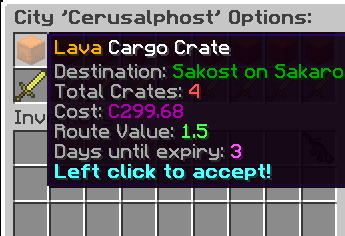 Only you will be able to pick these crates up for 1 hour so get them quickly! You can sell back crates at cost to an Importer in the same outpost you purchased them from. Sell the unwanted crates back by right clicking the importer with the crates in your inventory. Head back to your ship with the crates and place them on your sticky piston heads. Ensure your pistons are wired up so you can use a redstone pulse to release the crates in outpost land! Crates have special rules to be noted. Crates are not able to be placed into any kind of container. Crates can only be held in the player inventory if not flying. Upon piloting all held crates will be dropped. 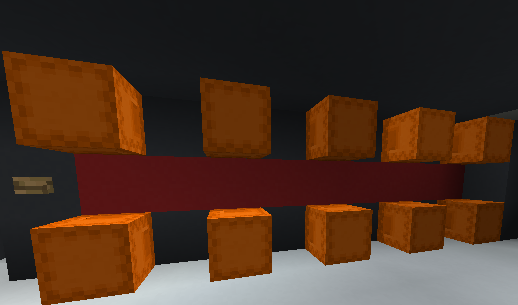 Crates can only be placed on sticky piston heads and must not be adjacent to another crate, even diagonally. 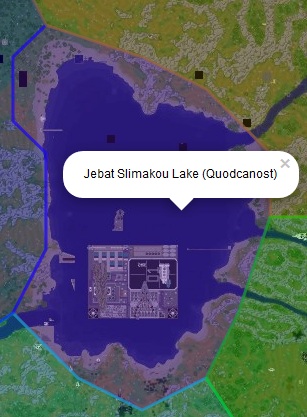 After you are loaded up with crates, locate your destination on the dynmap and fly there. Locate the Importer and Exporter Npcs with the crates in your inventory. Right click the Importer Npc this time and you should see a message similar to the one below. Take your newly earned money and buy some more crates and repeat the process!